The Highest Quality Materials, The Most Talented Artists, The BEST. How The Best Sign Monuments Are Made. The Best Sign Monuments are constructed using the nationally recognized EIFS (Exterior Insulated Finishing System). EPS - Expanded poly-styrene is the base of each structure's shape and design. The shape is cut using hot-wire technology. Fibrous Resin Hard Coat - This is the exterior strength in the structure. Tinted Acrylic Stucco - Textured just like traditional stucco, we are able to use multiple colors on a single monument and can match your building's paint color system. 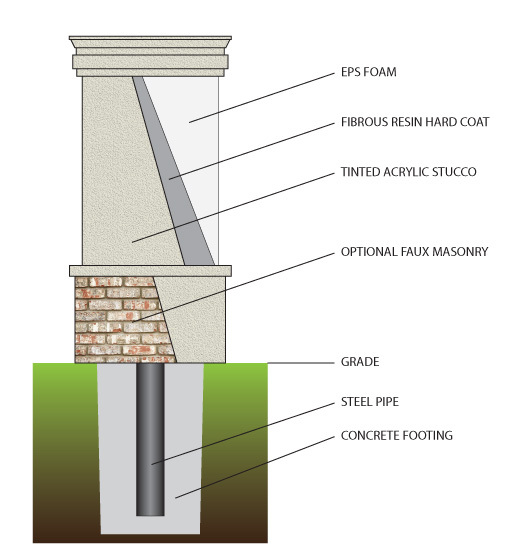 Optional Faux Masonry - We have many brick styles and stone masonry options. We also match architectural textures and elements. Grade - The monuments sit flat on the grade, no concrete slab required. Landscaping is commonly added around the bases to add softscaping. Steel Pipe - These supplied pipes are for the installation of the monuments into the ground on your site. Concrete Footing - Depths vary to local code. We start with a large EPS (Styrofoam) foam block. Your sign monument design is cut to shape using 3-D hot-wire technology. Our software allows the use of removed material to add decorative accents and even embossed graphics. Once all of the shapes are cut from the foam core, we then assemble for the next step - the resin coating. We spray a thick coating of acrylic resin, which is what gives the monument structure its structural integrity. The next step in fabrication is to spray a tinted acrylic stucco textured top coat. The History of EIFS (Exterior Insulated Finishing System). Exterior insulation and finishing system (EIFS) is a general class of non-load bearing building cladding systems that provides exterior walls and other structures with an insulated, water-resistant, finished surface in an integrated composite material system. EIFS was developed in Europe after World War II and was initially used to retrofit masonry walls. EIFS started to be used in North America in the 1960s, and became very popular in the mid- 1970s due to the oil embargo and the resultant surge in interest in high energy efficiency wall systems such as EIFS provides. Early uses were on masonry buildings, but since then the majority of uses were on wood framed buildings and molded architectural elements. In the early 1990's EIFS became the go-to solution for free-standing, signage applications. As of 1997 EIFS accounted for about 4% of the residential siding market , 12% of the commercial siding market and about 45% of the sign monument market. As EIFS effectively and beautifully replicates faux stone, brick and other textures, it is often the preference over standard masonry. Municipalities too, in the 1990's came on board with the monument structures as well, commonly adding them to their permit regulations. Two important reasons are the up-scale esthetics adding beauty to a community but also the EIFS system's ability to exceed breakaway codes in the event of vehicle collisions. Also, when municipalities are using eminent domain for street widening projects, these monument structures can easily be removed from their concrete footings and moved to new positions, thereby saving tax pay dollars in signage replacements for affected businesses. The monuments themselves are not in need of any poured concrete slab for installation, yet with their interior structure, steel posts and concrete footers, they can withstand up to 160 mph winds. More often than not they are more commonly hit by cars. On this occasion, the EIFS monuments exceed breakaway codes as it is far better to hit than a wall of masonry resulting in far less damage to both the car and monument. The best benefit of EIFS is the option to add architectural details that are composed of the same materials, literally the sky is the limit of what can be designed with these materials. They are widely used on residential/commercial projects in North America and are gaining popularity worldwide.